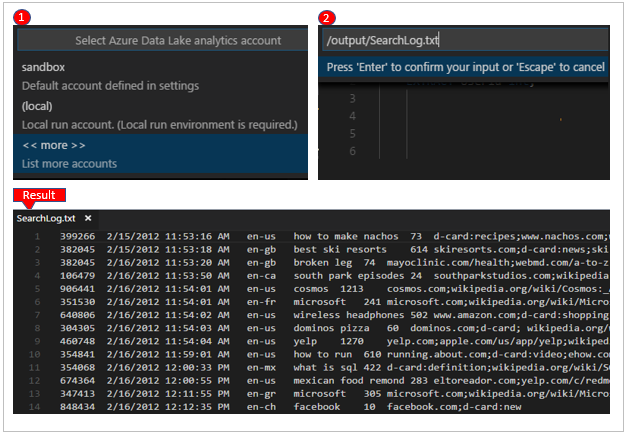 Azure Data Lake Tools for VS Code supports Windows, Linux, and macOS. U-SQL local run and local debug works only in Windows. 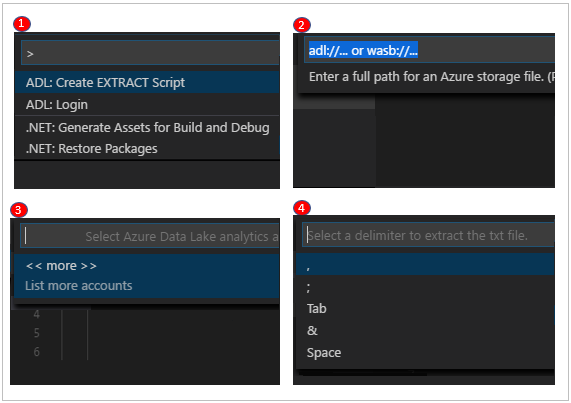 After you install the prerequisites, you can install Azure Data Lake Tools for VS Code. Select Extensions in the left pane. 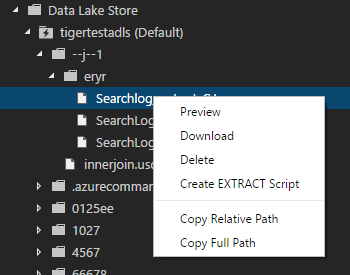 Enter Azure Data Lake Tools in the search box. 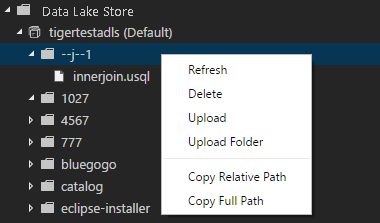 Select Install next to Azure Data Lake Tools. After a few seconds, the Install button changes to Reload. Select Reload to activate the Azure Data Lake Tools extension. Select Reload Window to confirm. 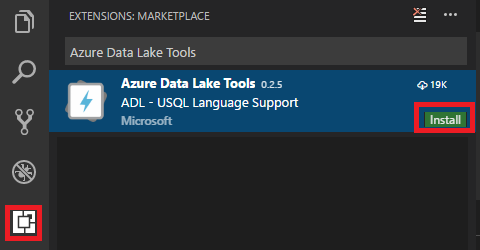 You can see Azure Data Lake Tools in the Extensions pane. Create a .usql file or open an existing .usql file to activate the extension. To work with U-SQL, you need open either a U-SQL file or a folder. Open the command palette (Ctrl+Shift+P) and enter ADL: Open Sample Script. It opens another instance of this sample. You can also edit, configure, and submit a script on this instance. From Visual Studio Code, select the File menu, and then select Open Folder. Specify a folder, and then select Select Folder. Select the File menu, and then select New. An Untitled-1 file is added to the project. The script creates a departments.csv file with some data included in the /output folder. Save the file as myUSQL.usql in the opened folder. Select Ctrl+Shift+P to open the command palette. Enter ADL: Compile Script. The compile results appear in the Output window. You can also right-click a script file, and then select ADL: Compile Script to compile a U-SQL job. The compilation result appears in the Output pane. Enter ADL: Submit Job. You can also right-click a script file, and then select ADL: Submit Job. 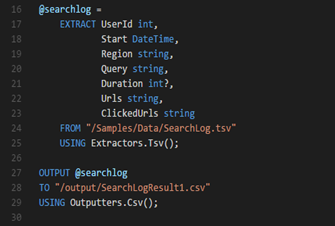 After you submit a U-SQL job, the submission logs appear in the Output window in VS Code. The job view appears in the right pane. If the submission is successful, the job URL appears too. You can open the job URL in a web browser to track the real-time job status. On the job view's SUMMARY tab, you can see the job details. Main functions include resubmit a script, duplicate a script, and open in the portal. On the job view's DATA tab, you can refer to the input files, output files, and resource files. Files can be downloaded to the local computer. You can set the default context to apply this setting to all script files if you have not set parameters for files individually. Enter ADL: Set Default Context. Or right-click the script editor and select ADL: Set Default Context. Choose the account, database, and schema that you want. The setting is saved to the xxx_settings.json configuration file. Enter ADL: Set Script Parameters. account: An Azure Data Lake Analytics account under your Azure subscription that's needed to compile and run U-SQL jobs. You need configure the computer account before you compile and run U-SQL jobs. database: A database under your account. The default is master. schema: A schema under your database. The default is dbo. priority: The priority range is from 1 to 1000, with 1 as the highest priority. The default value is 1000.
degreeOfParallelism: The parallelism range is from 1 to 150. The default value is the maximum parallelism allowed in your Azure Data Lake Analytics account. After you save the configuration, the account, database, and schema information appear on the status bar at the lower-left corner of the corresponding .usql file if you don’t have a default context set up. Enter ADL: Set Git Ignore. If you don’t have a .gitIgnore file in your VS Code working folder, a file named .gitIgnore is created in your folder. Four items (usqlCodeBehindReference, usqlCodeBehindGenerated, .cache, obj) are added in the file by default. You can make more updates if needed. If you already have a .gitIgnore file in your VS Code working folder, the tool adds four items (usqlCodeBehindReference, usqlCodeBehindGenerated, .cache, obj) in your .gitIgnore file if the four items were not included in the file. Azure Data Lake Tools supports multiple custom codes. 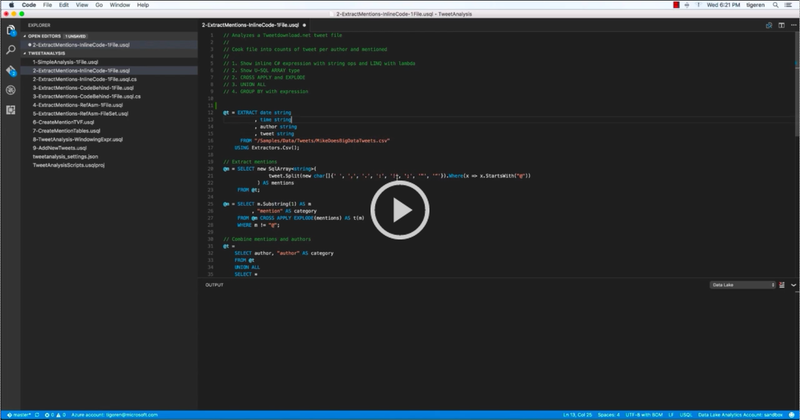 For instructions, see Develop U-SQL with Python, R, and C Sharp for Azure Data Lake Analytics in VS Code. For information on developing assemblies, see Develop U-SQL assemblies for Azure Data Lake Analytics jobs. You can use Data Lake Tools to register custom code assemblies in the Data Lake Analytics catalog. You can register the assembly through the ADL: Register Assembly or ADL: Register Assembly (Advanced) command. Specify the local assembly path. Select a Data Lake Analytics account. The portal is opened in a browser and displays the assembly registration process. A more convenient way to trigger the ADL: Register Assembly command is to right-click the .dll file in File Explorer. Enter ADL: Register Assembly (Advanced). The JSON file is displayed. Review and edit the assembly dependencies and resource parameters, if needed. Instructions are displayed in the Output window. To proceed to the assembly registration, save (Ctrl+S) the JSON file. Azure Data Lake Tools autodetects whether the DLL has any assembly dependencies. The dependencies are displayed in the JSON file after they're detected. You can upload your DLL resources (for example, .txt, .png, and .csv) as part of the assembly registration. Another way to trigger the ADL: Register Assembly (Advanced) command is to right-click the .dll file in File Explorer. The following U-SQL code demonstrates how to call an assembly. In the sample, the assembly name is test. The local run and local debug feature only works in Windows environments, and is not supported on macOS and Linux-based operating systems. For instructions on local run and local debug, see U-SQL local run and local debug with Visual Studio Code. 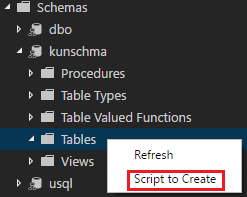 Before you can compile and run U-SQL scripts in Data Lake Analytics, you must connect to your Azure account. Enter ADL: Login. The login information appears on the lower right. Select Copy & Open to open the login webpage. Paste the code into the box, and then select Continue. Follow the instructions to sign in from the webpage. 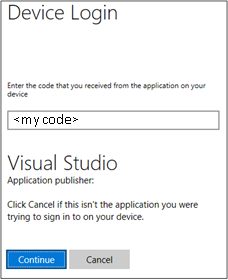 When you're connected, your Azure account name appears on the status bar in the lower-left corner of the VS Code window. Data Lake Tools automatically signs you in the next time if you don't sign out. If your account has two factors enabled, we recommend that you use phone authentication rather than using a PIN. To sign out, enter the command ADL: Logout. 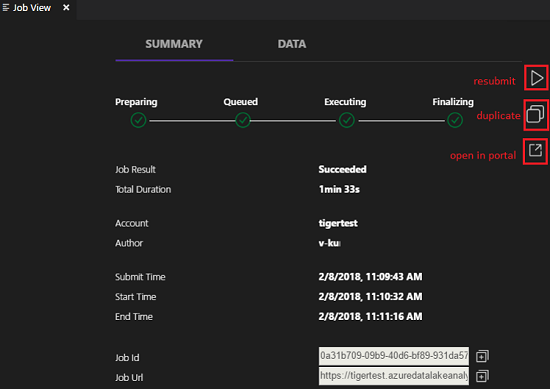 Expand AZURE DATALAKE, select Sign in to Azure, and then follow step 3 and step 4 of To connect to Azure by using a command. You can't sign out from the explorer. To sign out, see To connect to Azure by using a command. 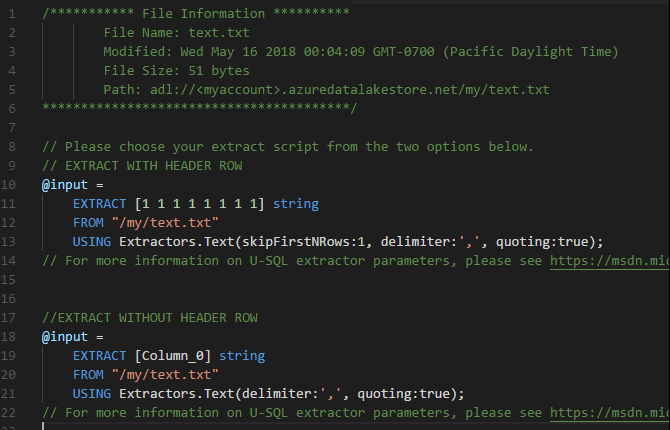 You can create an extraction script for .csv, .tsv, and .txt files by using the command ADL: Create EXTRACT Script or from the Azure Data Lake explorer. Select Ctrl+Shift+P to open the command palette, and enter ADL: Create EXTRACT Script. Specify the full path for an Azure Storage file, and select the Enter key. For a .txt file, select a delimiter to extract the file. The extraction script is generated based on your entries. For a script that cannot detect the columns, choose one from the two options. If not, only one script will be generated. 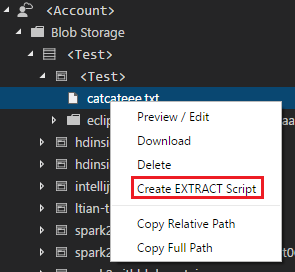 Another way to create the extraction script is through the right-click (shortcut) menu on the .csv, .tsv, or .txt file in Azure Data Lake Store or Azure Blob storage. You can access Azure Data Lake Analytics resources to list accounts, access metadata, and view analytics jobs. Enter ADL: List Accounts. The accounts appear in the Output pane. Select Ctrl+Shift+P, and then enter ADL: List Tables. Select one of the Data Lake Analytics accounts. Select one of the Data Lake Analytics databases. Select one of the schemas. You can see the list of tables. Open the command palette (Ctrl+Shift+P) and select ADL: Show Jobs. Select a Data Lake Analytics or local account. Wait for the job list to appear for the account. Select a job from the job list. Data Lake Tools opens the job view in the right pane and displays some information in the VS Code output. 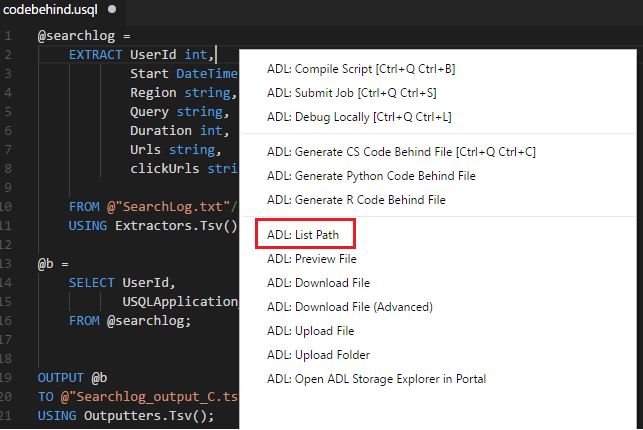 Right-click the script editor and select ADL: List Path. Select your Data Lake Analytics account. Browse to or enter the storage folder path (for example, /output/). The command palette lists the path information based on your entries. A more convenient way to list the relative path is through the shortcut menu. Right-click the path string and select List Path. Right-click the script editor and select ADL: Preview File. 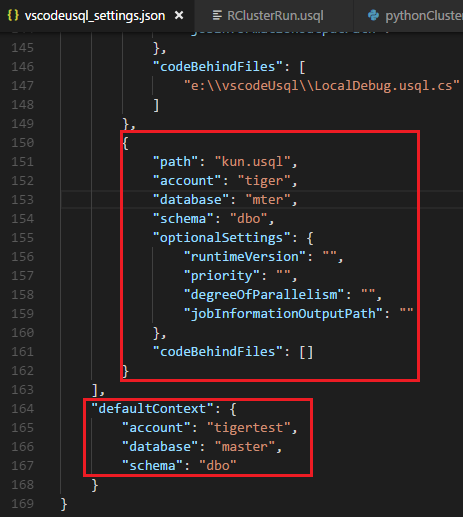 Enter an Azure Storage file path (for example, /output/SearchLog.txt). The file opens in VS Code. Another way to preview the file is through the shortcut menu on the file's full path or the file's relative path in the script editor. Right-click the script editor and select Upload File or Upload Folder. Choose one file or multiple files if you selected Upload File, or choose the whole folder if you selected Upload Folder. Then select Upload. Select Choose Current Folder to specify your upload destination. Another way to upload files to storage is through the shortcut menu on the file's full path or the file's relative path in the script editor. You can monitor the upload status. You can download a file by using the command ADL: Download File or ADL: Download File (Advanced). Right-click the script editor, and then select Download File (Advanced). VS Code displays a JSON file. You can enter file paths and download multiple files at the same time. Instructions are displayed in the Output window. To proceed to download the file or files, save (Ctrl+S) the JSON file. The Output window displays the file download status. You can monitor the download status. Right-click the script editor, select Download File, and then select the destination folder from the Select Folder dialog box. 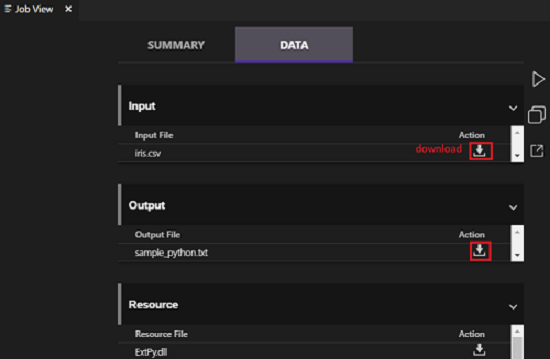 Browse to or enter the storage folder path (for example, /output/), and then choose a file to download. Another way to download storage files is through the shortcut menu on the file's full path or the file's relative path in the script editor. The upload and download status appears on the status bar. Select the status bar, and then the status appears on the OUTPUT tab. 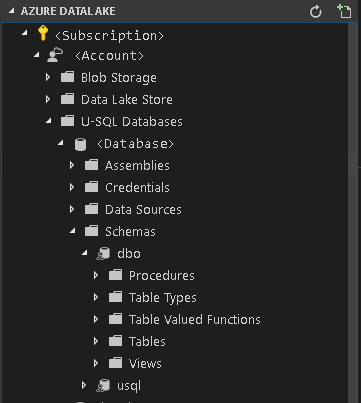 After you log in, all the subscriptions for your Azure account are listed in the left pane, under AZURE DATALAKE. Expand your Azure subscription. Under the U-SQL Databases node, you can browse through your U-SQL database and view folders like Schemas, Credentials, Assemblies, Tables, and Index. Expand U-SQL Databases. You can create a database, schema, table, table type, index, or statistic by right-clicking the corresponding node, and then selecting Script to Create on the shortcut menu. On the opened script page, edit the script according to your needs. Then submit the job by right-clicking it and selecting ADL: Submit Job. After you finish creating the item, right-click the node and then select Refresh to show the item. You can also delete the item by right-clicking it and then selecting Delete. You can register an assembly in the corresponding database by right-clicking the Assemblies node, and then selecting Register assembly. You can right-click the folder node and then use the Refresh, Delete, Upload, Upload Folder, Copy Relative Path, and Copy Full Path commands on the shortcut menu. You can right-click the file node and then use the Preview, Download, Delete, Create EXTRACT Script (available only for CSV, TSV, and TXT files), Copy Relative Path, and Copy Full Path commands on the shortcut menu. 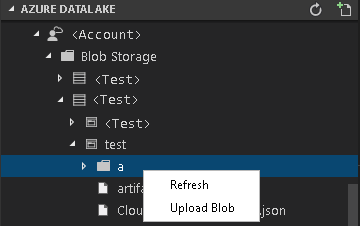 You can right-click the blob container node and then use the Refresh, Delete Blob Container, and Upload Blob commands on the shortcut menu. You can right-click the folder node and then use the Refresh and Upload Blob commands on the shortcut menu. 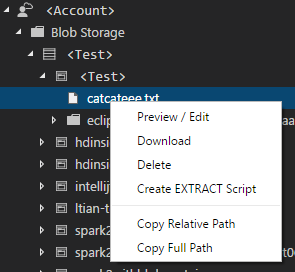 You can right-click the file node and then use the Preview/Edit, Download, Delete, Create EXTRACT Script (available only for CSV, TSV, and TXT files), Copy Relative Path, and Copy Full Path commands on the shortcut menu. Enter Open Web Azure Storage Explorer or right-click a relative path or the full path in the script editor, and then select Open Web Azure Storage Explorer. Data Lake Tools opens the Azure Storage path in the Azure portal. You can find the path and preview the file from the web. 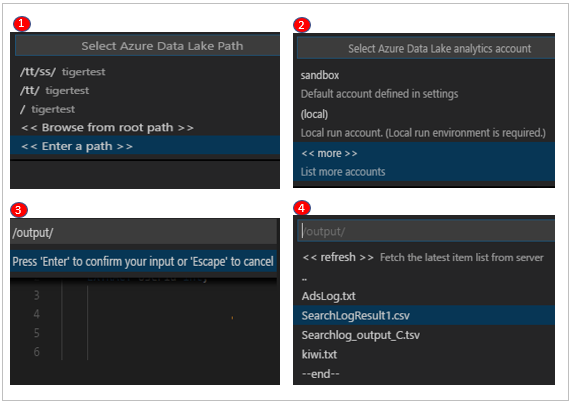 IntelliSense autocomplete on Data Lake Analytics metadata: Data Lake Tools downloads the Data Lake Analytics metadata information locally. 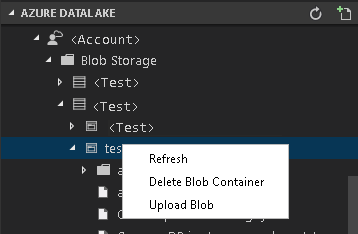 The IntelliSense feature automatically populates objects from the Data Lake Analytics metadata. These objects include the database, schema, table, view, table-valued function, procedures, and C# assemblies. 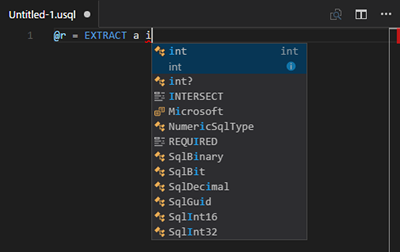 IntelliSense error marker: Data Lake Tools underlines editing errors for U-SQL and C#. Syntax highlights: Data Lake Tools uses colors to differentiate items like variables, keywords, data types, and functions. We recommend that you upgrade to Azure Data Lake Tools for Visual Studio version 2.3.3000.4 or later. The previous versions are no longer available for download and are now deprecated.